And by fancy food I mean the opposite of that. All the foods below, as well as the liver sausage and curry powder above, are available for sale on Amazon.com - believe it or not, there is very little NOT for sale on that site. It's incredible really and I can't stop staring. 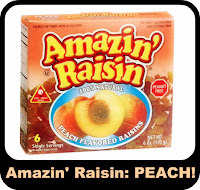 ..
One thing that seems to be quite popular are foods that taste like other foods. 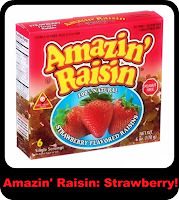 Not in the crazy genetically modified way where a strawberry tastes like flounder but in the regular way where all the natural flavor is sucked out and replaced with a chemical replica of an entirely other flavor. 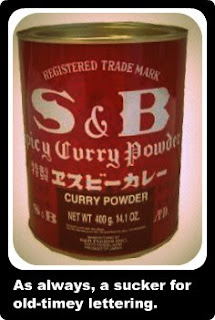 Frankly this amazin' packaging reminds me of something I would have really wanted to have in my lunchbox.... back in 6th grade. In the eighties. When claymation California raisins swept the nation. And Cabbage Patch Kids ruled the world. 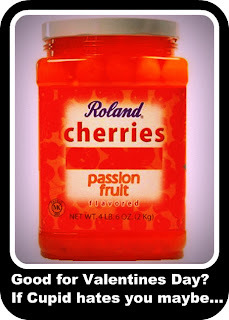 Personally I love cherries and I will also confess to a secret love for maraschino cherries. 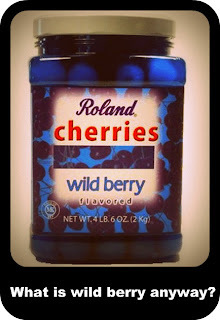 So naturally I am drawn to these very UN-natural cherries. However what you are looking at are four pound jars. 4 POUNDS. 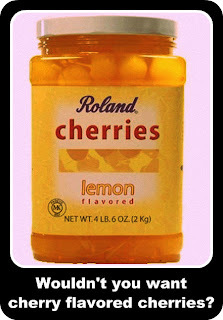 Yep, you know you secretly want a four pound (FOUR POUND) jar of phony flavored cherries. Right, right, moving RIGHT along. 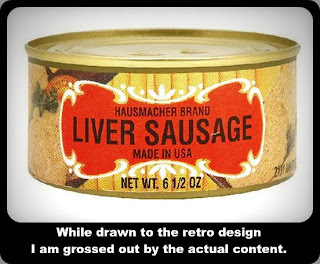 Ok, so, there is no time (except once - see below) when I am drawn to meat in a can. 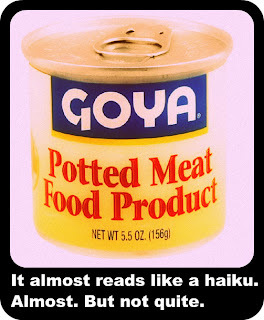 Even when it's fake meat in a can. 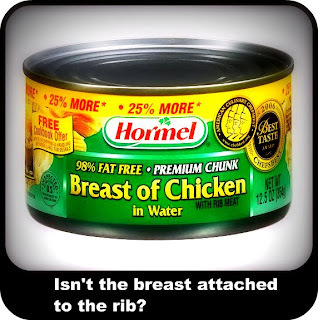 It would be safe to say that I am completely repelled by meat in a can. And if you know me, you know that I barely even deal with frozen meat in a box. This might be because of one time being given a microwaved strip of chicken meat that had been pried out of a Lean Cuisine by a well-meaning adult in my life. And probably also because one time, out of curiosity, I ate a whole can of Vienna wieners while sitting on the roof of my grandparents house. Well tried to anyway, I ate about 4 of them before tossing the can into the bushes. Ugh, revolting. Moving along, nothing to see. 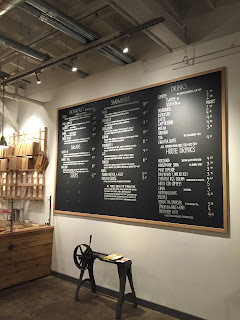 Did you know that there are the many different flavorings available? I mean other than vanilla or anise. 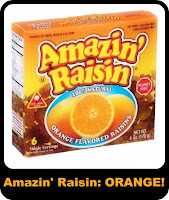 Which makes sense since re-flavoring everything is all the rage these day. "Re-flavoring"... that is my contribution to the English language in 2010. You are very welcome. 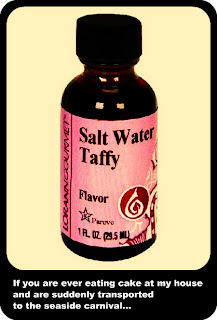 I would suggest that salt water taffy is on the fast track for being THE flavor of 2010. I am pretty sure that everyone is over cotton candy flavor. And plain old peppermint doesn't have the summery beachy-ness that salt water taffy does. Right? Right? 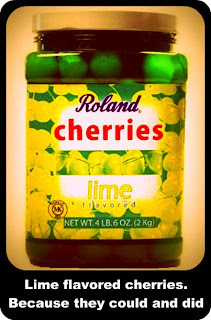 Salt water taffy flavored cherries anyone? Ok, so ever since my lovely ex-coworker and I discover the magical transformational properties of Hot Salt, I have been trying to find it on supermarket shelves since. It has to be Hot Salt. 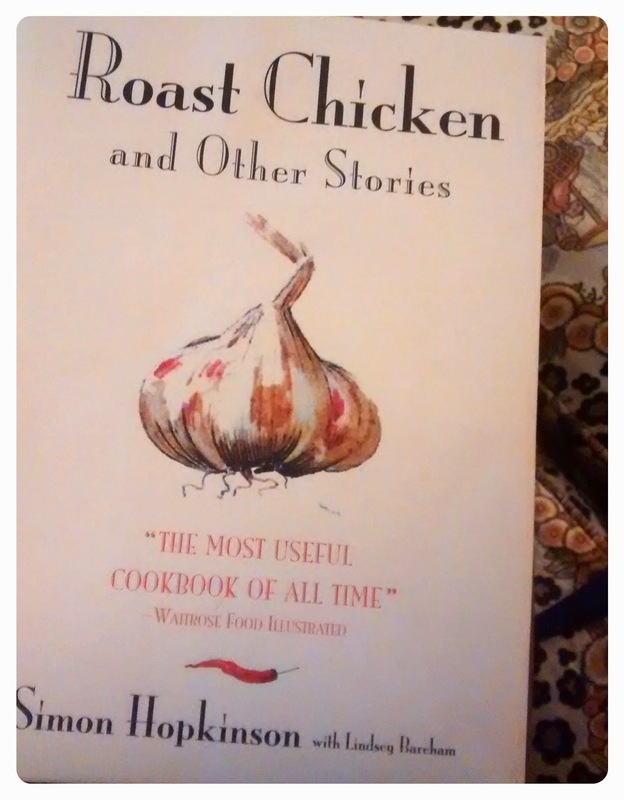 We've tried the alternatives, the designer impostors if you will, and they are NOT the same as the original Hot Salt. End of story. 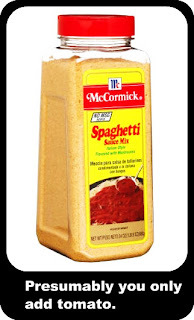 But in all that time scanning the spice shelves of every supermarket I shop in, I have never seen spaghetti sauce mix. It must be a regional thing or something. This is something I would eat with baby carrots. Or sprinkled on a piece of buttered toast. True story. 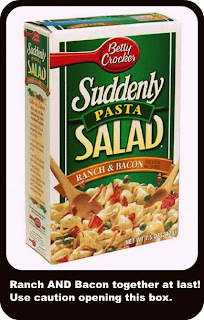 Firstly I cannot believe that there is a product out there called "Suddenly Salad". Which is really is un-sudden pasta in a box. At least I think that is what it is. It's possible I was distracted by the fact that it is flavored with both ranch AND bacon. That to me is AWESOME but the AWESOMENESS of ranch AND bacon is canceled by the sudden part. I half expect something to suddenly burst out of the box when I open it. That sh*t is scary! I can't exactly put my finger on exactly why this packaging irritates me so much, but it sure does. And how can anyone possibly think that they'd be committing a sin by eating full calorie instant pudding? Seriously! Well, so there you are. 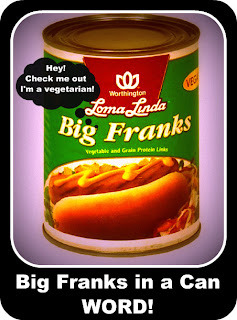 I hope you've enjoyed this little tour of freaky foods. 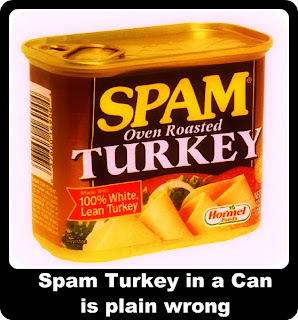 Hopefully I haven't completely offended anyone by dissing their beloved potted meat food product. Like they say, there is a foot for every shoe... something like that. Also, I had a lot of fun playing with the photos and I hope you liked them too!